Kyle Grillot - kgrillot@shawmedia.com Naval cadets Cortlandt Baum, 15, (from left) Andrew Cotsiomitis, 14, and Jacobs Glaysher, 15, all of Cary, wait for the start of the Fox River Grove Memorial Day parade Monday in Fox River Grove. 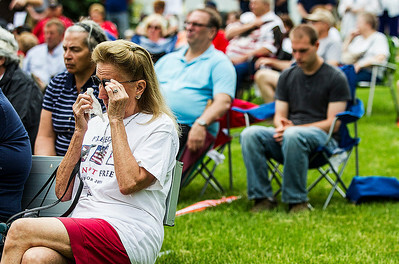 Kyle Grillot - kgrillot@shawmedia.com Charlaine Tiffany of McHenry wipes her eyes while listening to Chaplain Gary Snell read off the names of the recently deceased during the Memorial Day ceremony Monday in McHenry. Tiffany's husband, Korean War Veteran Arthur Tiffany, was one of the names listed. 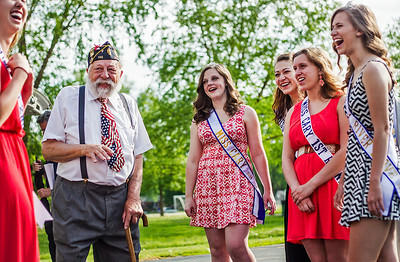 Kyle Grillot - kgrillot@shawmedia.com Post Commander of American Legion 119 Marv Jedicker jokes with Kendall Teufel, 17, (from left) Kelly Cunningham,16, Brianna Galvin, 17, Rachel Ahlers, 17, and Magalie Baker, 17, before the start of the Fox River Grove Memorial Day parade Monday in Fox River Grove. 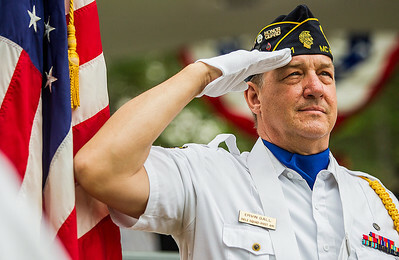 Kyle Grillot - kgrillot@shawmedia.com Honor Guard member Ervin Gall of McHenry salutes the flag while the Pledge of Allegiance is played during the Memorial Day ceremony Monday in McHenry. 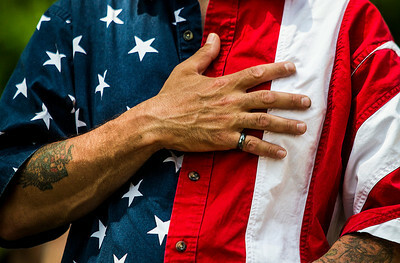 Kyle Grillot - kgrillot@shawmedia.com Cary Levin of Huntley puts his hand over his heart while God Bless America is played during the Memorial Day cemetery service Monday in Crystal Lake. Kyle Grillot - kgrillot@shawmedia.com Spectators gather on Bloner Parkway to watch the Fox River Grove Memorial Day parade Monday in Fox River Grove. 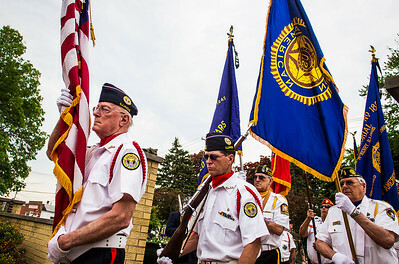 Kyle Grillot - kgrillot@shawmedia.com Polish Legion of American Veterans member Ralph Thoma of McHenry (left) leads the honor guard during the Memorial Day ceremony Monday in McHenry. 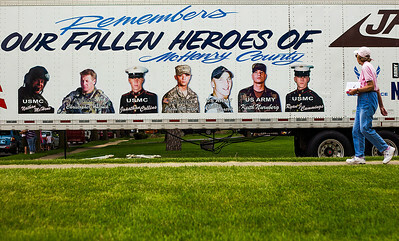 Kyle Grillot - kgrillot@shawmedia.com Valary Banker of Crystal Lake looks to a memorial truck for deceased McHenry County soldiers while she exits Union Cemetery after the Memorial Day cemetery service Monday in Crystal Lake. Banker's son, Bradley Banker, is currently serving at Bagram Air Base in Afghanistan. 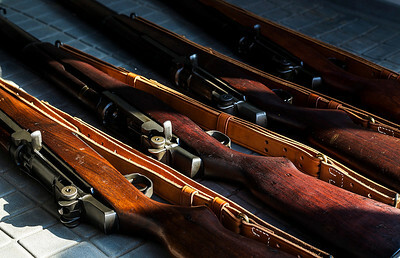 Kyle Grillot - kgrillot@shawmedia.com Rifles wait to be removed from a vehicle before the start of the Fox River Grove Memorial Day parade Monday in Fox River Grove. 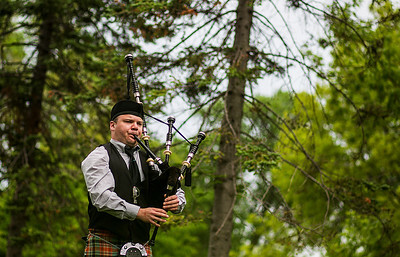 Kyle Grillot - kgrillot@shawmedia.com Tom Hinrichsen of Batavia plays his bagpipe in Veteran's Memorial Park before the start of the Memorial Day ceremony Monday in McHenry. 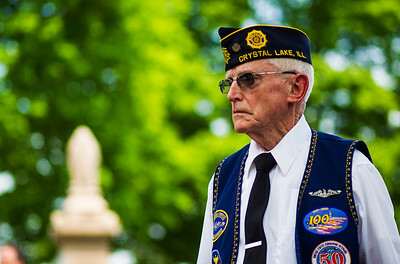 Kyle Grillot - kgrillot@shawmedia.com Navy veteran Jim Dyson of Crystal Lake listens to the closing of the Memorial Day cemetery service Monday in Crystal Lake. 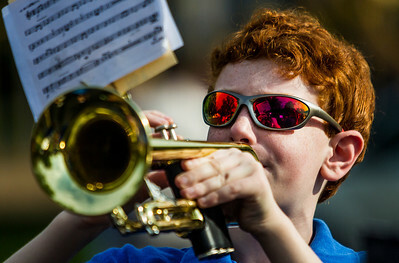 Kyle Grillot - kgrillot@shawmedia.com Robbie Nollett, 12, plays with the Fox River Grove middle school band before the start of the Fox River Grove Memorial Day parade Monday in Fox River Grove. 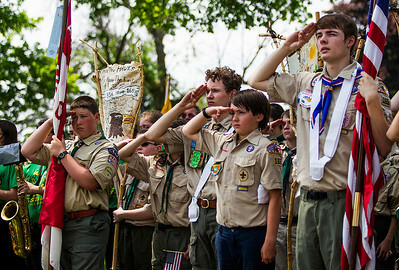 Kyle Grillot - kgrillot@shawmedia.com Scouts from Crystal Lake's Troop 165 salute the flag during the playing of God Bless America during the Memorial Day cemetery service Monday in Crystal Lake. 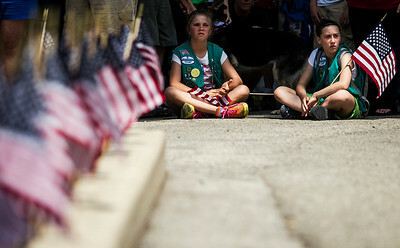 Kyle Grillot - kgrillot@shawmedia.com Girl Scouts from Troop 97 listen to Voices in Harmony group play a song during the playing of God Bless America during the Memorial Day cemetery service Monday in Crystal Lake. 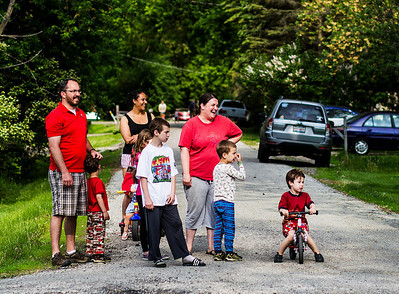 Kyle Grillot - kgrillot@shawmedia.com Cary Levin of Huntley (right) exits Union cemetery with a passenger after the Memorial Day cemetery service Monday in Crystal Lake. 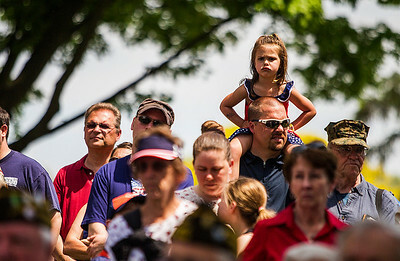 Kyle Grillot - kgrillot@shawmedia.com Spectators listen to the Voices in Harmony group play a song during the playing of God Bless America during the Memorial Day cemetery service Monday in Crystal Lake. 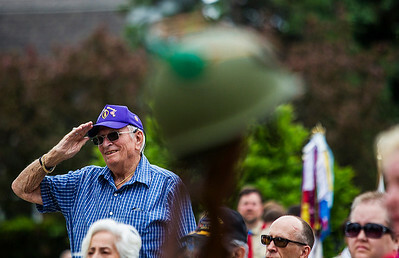 Kyle Grillot - kgrillot@shawmedia.com WWII veteran Chuck Budreck of McHenry salutes the flag while America, The Beautiful is played during the Memorial Day ceremony Monday in McHenry. 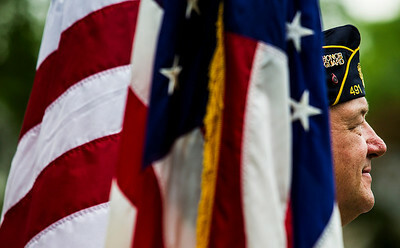 Kyle Grillot - kgrillot@shawmedia.com Honor Guard member Ervin Gall of McHenry listens to the invocation given by Chaplian Gary Snell during the Memorial Day ceremony Monday in McHenry. 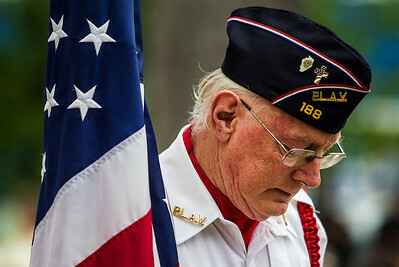 Kyle Grillot - kgrillot@shawmedia.com Polish Legion of American Veterans member Ralph Thoma of McHenry listens while America, The Beautiful is played during the Memorial Day ceremony Monday in McHenry. Tom Hinrichsen of Batavia plays his bagpipe in Veteran's Memorial Park before the start of the Memorial Day ceremony Monday in McHenry.